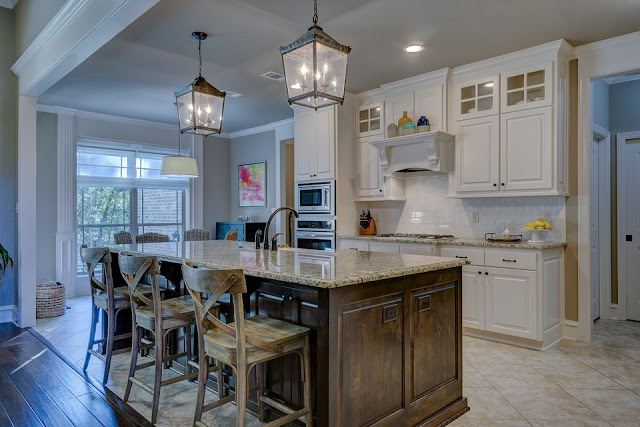 Most of us think of open concept kitchen and living areas as the latest trend in home building. The truth is, from the earliest days of Colonial history until the Victorian Age, open concept described the architectural style of most homes unless the owner was quite wealthy. Since my husband and I are painting the small kitchen in our South Florida condo, and I want to make use of every square inch even though it’s not open concept, I began to wonder about the history of kitchens in America. That’s just the way my mind rolls. The Library of Congress is a great resource, so I started my research there. 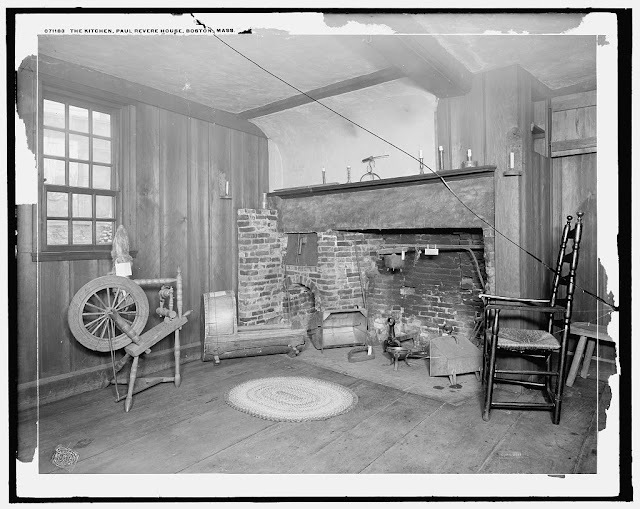 Browsing through the archives, I stumbled upon photos of restored kitchens used by our founders and other well-known Americans. The kitchen has always been the heart of the home, but in the founding days of our Republic and during westward expansion, kitchens also served as living room, bedroom, and dining room as well…unless you lived at the White House or in wealthier homes where kitchens were housed in separate buildings to keep the house cool and as a deterrent to fire. Until modern times, kitchens were designed for function, not frivolity. 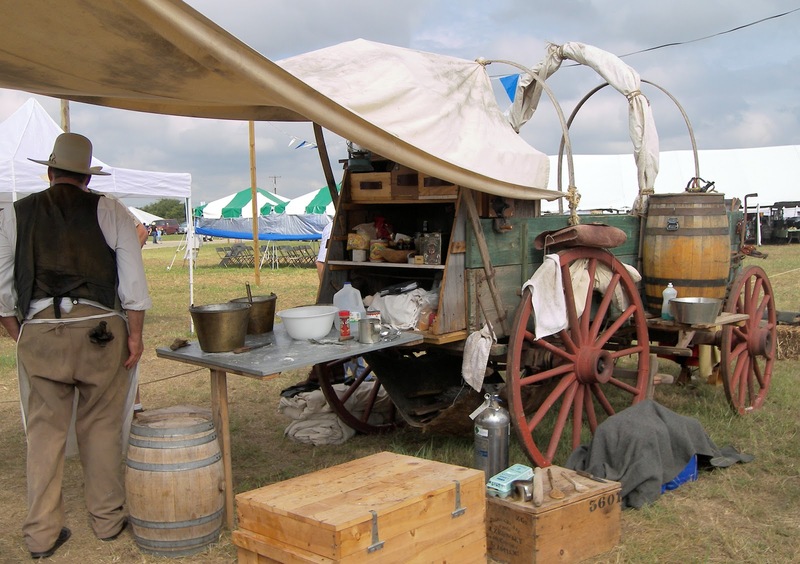 Even chuckwagons, used for storing food and cooking utensils and driven by cattlemen or pioneers headed west across the prairies, could be classified as kitchens, albeit rudimentary ones. The actual cooking was done over an open campfire. Let’s look at a few of the kitchens used by people whose names you’ll recognize. Photo by Carol M. Highsmith, photographer. Kitchen in the Ford Mansion. The mansion was the site of the "hard winter" December through May 1780 quarters of George Washington and the Continental Army at The Morristown National Historical Park in Morristown, New Jersey. Morristown New Jersey United States, 2017. -08-25. Photograph. https://loc.gov/item/2017882224/. In most American history books, the author will describe the hard winter of 1780 when George Washington’s Continental Army tied rags around their freezing feet and ears and huddled over campfires with little to eat. As the leader of the army, Washington stayed in the Ford Mansion, but even though he enjoyed better rations at a table warmed by the kitchen fireplace, he regularly rode among his troops to rally their spirits. After securing our freedom and serving as the first President of the United States, George Washington and his wife Martha retired to their large country estate named Mount Vernon. The home and its gardens and outbuildings sit on the banks of the Potomac River in Fairfax County, Virginia, and underwent expansion under Washington’s ownership. The Washington family had owned land there since 1674 when George’s great-grandfather put down roots. Detroit Publishing Co., Copyright Claimant, and Publisher Detroit Publishing Co.
Martha Washington kitchen at Mt. Vernon. Mount Vernon Estate Mount Vernon Estate United States Virginia, None. [Between 1900 and 1920] Photograph. 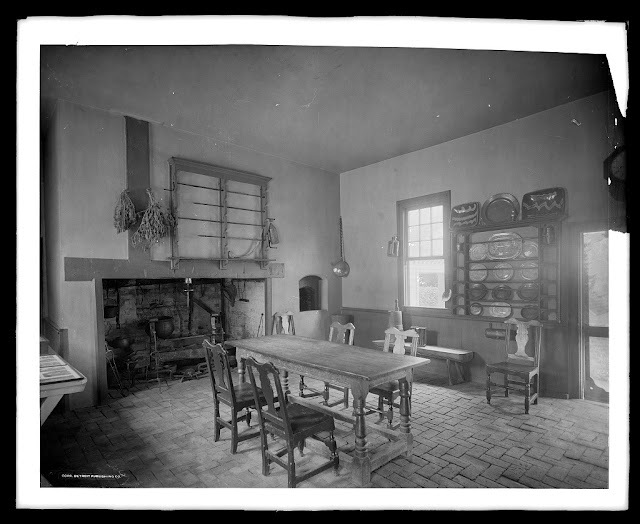 In 1775, the kitchen had been significantly enlarged from the original just before Washington assumed command of the Continental Army in Boston. It was comprised of three workrooms on the ground floor and a loft where food was stored and where the cook presumably slept. 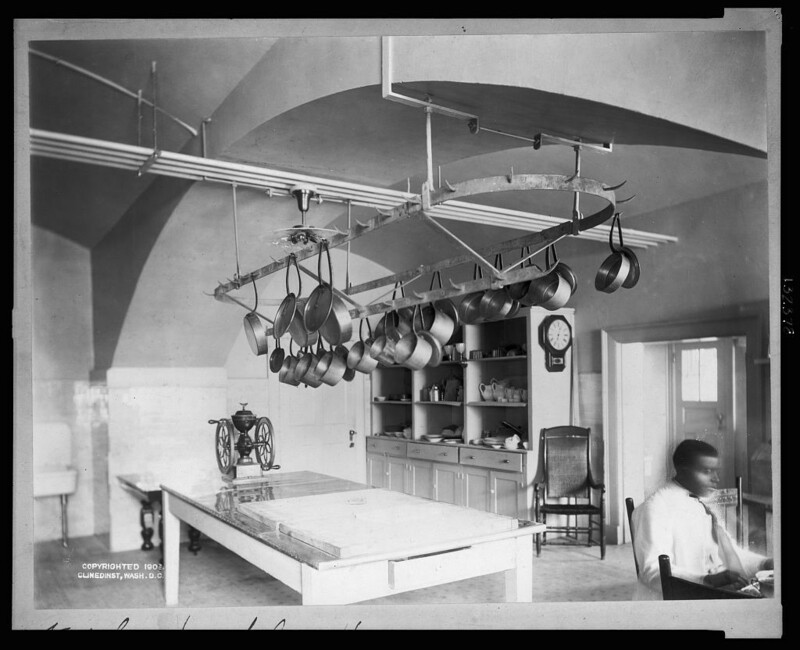 After Washington’s death, the inventory of the estate showed the kitchen was equipped with skillets, a griddle, a variety of pots and pans, a toaster, fire spits, coffeepots, and much more. 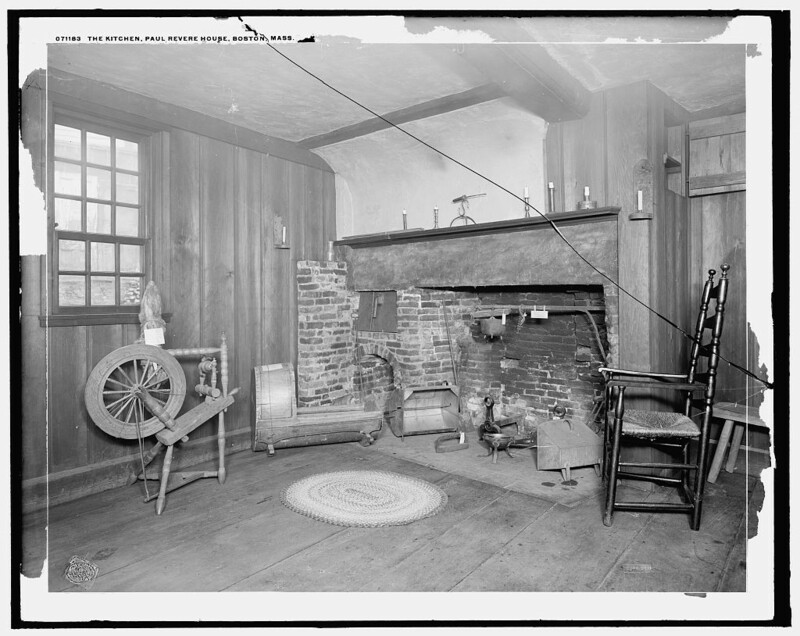 The Kitchen, Paul Revere House, Boston, Mass. Boston Boston. Massachusetts United States, ca. 1909. Photograph. The original three-story home of Colonial patriot Paul Revere is the oldest in downtown Boston. Built in 1680, rather than placing the kitchen in a separate building, it was housed in a two-story extension built on the back of the house. The prosperous silversmith and engraver is best known for his midnight ride in April 1775 to alert volunteers that the British were at the colonial militia’s doorstep. The battles of Lexington and Concord followed. No doubt, because of Revere’s wealth, his table would have been laden with the best the marketplace afforded. Washington, D.C., ca. 1902. Nov. 1906. Photograph. Of course, one of the most famous kitchens in America is that of the White House in Washington, DC. The photo above was taken early in the 20th Century when Theodore (Teddy) Roosevelt served as the 26th President of the United States. We can only assume the kitchen was well-equipped to handle state dinners and the hosting of world dignitaries. Learn more about the history of kitchens at the Library of Congress or Wikipedia.org. With the advent of the Internet, there is no subject that you can’t study, including the lowly kitchen. If you have a photo or know a story about the kitchen of another famous American, would you please share it with us? My feisty Irish bride Kate O'Brien McKean asks her husband for an annulment in Dreams of My Heart, book 1 of The Reluctant Brides series, setting off a chain reaction of events that endangers them both. The historical romance set in 1875 Montana Territory is published by Mountain Brook Ink. The book is available at Amazon in both ebook and print and free with Kindle Unlimited. After a career spent acquiring and editing books by numerous bestselling Christian authors, Barbara J. Scott has returned to her true love—writing. She is currently writing the second book in the Reluctant Brides series—Love of My Heart. Barbara and her husband Mike recently moved to the Ft. Lauderdale area to be closer to two of their four grandchildren. Reading, writing, and research are her passions. Want to know more? Connect with Barbara at www.BarbaraJScott.com. Thanks for the post! I too love kitchens!! Love this post. As a home ec major and teacher, I love old kitchens and always want to see them first when we visit historic homes. Makes me even more thankful for the modern conveniences in my own kitchen. Thanks for the great pictures. Back when we first started this blog, I did a post on kitchen stoves and was amazed at some the ones our ancestors used. Great post, Barb! Loved your pictures.